The Player of the Year race (now, like boxing, consisting of three separate titles) is heating up as the first three months of the tournament year is now behind us. 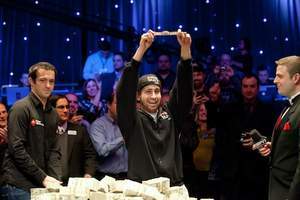 With the poker world gearing up for some of the biggest events of the year, including the EPT Grand Final in April and the WPT Championship in May, as well as the World Series of Poker approaching fast this summer. Jonathan Duhamel is still the front-runner in two of the three rankings, BLUFF Magazine and the Global Poker Index, while lurking in the Top 5 of the Cardplayer Magazine leader-board. But Duhamel’s status as the front-runner is coming under fire, with some big names shooting up the leader-boards, including Dan Kelly and Faraz Jaka on the BLUFF leader-board, Erick Cajelais and Noah Schwartz on the GPI leader-board, and Kelly, Jaka, and David “doc sands” Sands on Cardplayer’s leader-board. Here is a look at the updated leader-boards from the three ranking systems. This entry was posted on Saturday, April 7th, 2012 at 8:47 am and is filed under Poker News. You can follow any responses to this entry through the RSS 2.0 feed. You can leave a response, or trackback from your own site.